My name is Emma, you may also know me as Oooh Betty! I am a Vintage Village regular - if I am not selling my wares then I will always be there as a shopper. I like both equally. This Sunday, as always, I had my hand held out for my precious Vintage Village stamp on the dot of ten (possibly earlier but don't tell Alan and Sarah). I am always as giddy as a kipper for this monthly event and add the prestigious title of Finder of the Fair to my name and I was feeling like a 5 year old at a lucky dip! I won't lie, I have been busting for this job for quite some time so for me this was a big deal and I was taking the responsibility seriously. Lets be honest, everything looks better and feels better when the sun is out. So many pretty frocks, so many happy faces. At the moment I can't think beyond the long holidays, yellow beaches and pretty flowers so this month's Finds just had to reflect my mood and I would hope, everyone else's. So, in the words of Julie Andrews, these are a few of my favourite things. 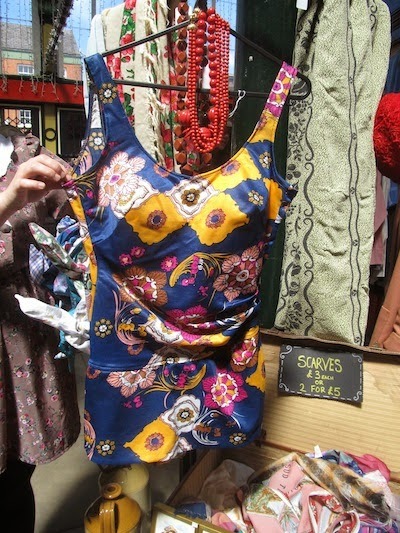 This bathing suit would give any woman curves, so much more flattering and demure than todays flimsy offerings. In the garden, on the beach, just looking good, these are an essential purchase. 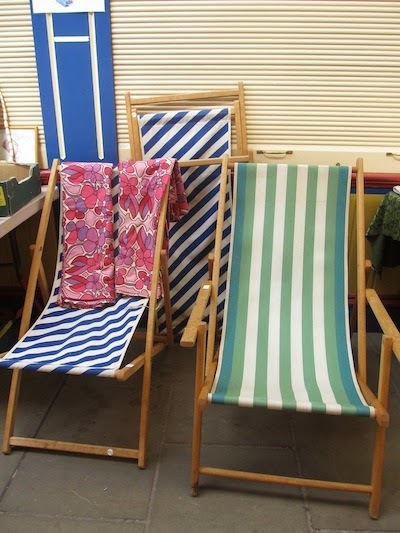 These traditional deck chairs are such a design classic and have totally stood the test of time. Yes, we have all sworn during the erection of one of these chairs but, let's be honest, they are comfy, portable and, most importantly, their candy stripes make them irresistible. I love the one with the arms and the green stripes, definitely a bit special. 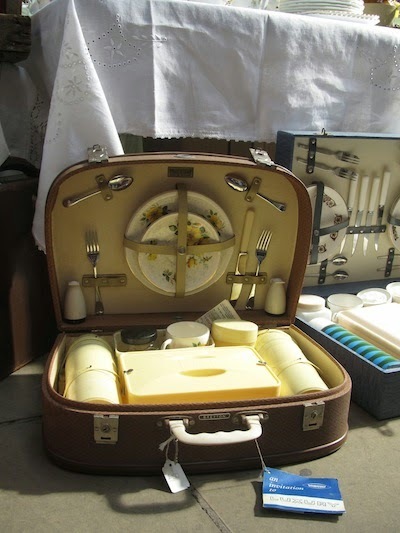 I love a good picnic hamper and this one was just beautiful. I loved the fact that it came in what looked like a traditional brown suitcase. I liked the rounded edges and its compact size. The fact that this was a set for two, and I have a family of five, would not be an immediate problem; mother is always on hand for a bit of impromptu children sitting and Mr Betty does love a pork pork pie! Pimms, Sangria, Crabbies, I love em all. A decent sized glass jug is an essential purchase for al fresco drinking and dining. If there are matching glasses to boot then one has it all. Orange is my favourite colour so this set stood out straight away. If I wasn't already the proud owner of enough glasses to open a beach bar then these would have been coming home with me. I would like to imagine that a Vintage Villager is sipping their drink of choice from them as I type these words. If one is going to be fashioning a vintage summer frock this season one must also be seen to be swinging a traditional wicker basket. Skipping and whistling is optional. These baskets are perfect for so many things. A picnic, grocery shopping, storing one's fabrics and yarns, the list goes on. I am the owner of a number of said baskets so I am somewhat of an authority on their usefulness. These two examples were right up there with my most desired of baskets, just lovely. I hope you like my Vintage Village favourites. I like to write about my Vintage Village trips on my blog every month and I always share my purchases. [Editor] Yes, we like your favourites very much indeed, Emma! What a lovely sunny, Summery romp around our fair, thank you! I am picturing myself stood outside a glamourous hotel - my preference would be the Amalfi coast - with these neatly stacked by my side. The top case would contain a number of pretty headscarves, a bottle of Pimms and most importantly the most perfect of bathing suits. I myself am not a keen garden, quite the opposite in fact. I leave most of my garden maintenance to my ageing mother. The thing is, though, I just love flowers. Gardening, unlike lots of other things in this world, is much the same as it has always been. 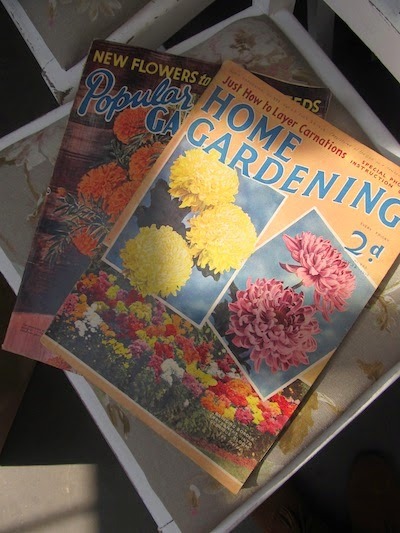 These magazines are so pretty and they contained some great, back to basics advice and, more importantly to me, lots of pretty pictures. One of the most important parts of the whole garden living/sunbathing ritual, is some tunes mixed in with a bit of topical discussion. When outdoors I don't think that having a bass boost (god I'm old) or a sub woofer is really a good idea. I believe that a good old fashioned radio is far more chic. This radio just oozes style, I am a sucker for old electrical items and if it has been made in a coloured plastic I am hooked! Penelope Cat Vintage had this little gem among her most fantastic children's book collection. I love these books and have quite a collection myself. My youngest loves these old story books, they are often quite amusing for all the wrong reasons. The illustrations tell of a simpler life that I for one am trying to achieve. Who doesn't have fond memories of ill equipped fishing trips and the real belief that one would catch something that could feed the whole family. Everyone should revisit these little gems . . . and they look ace on one's book shelves. 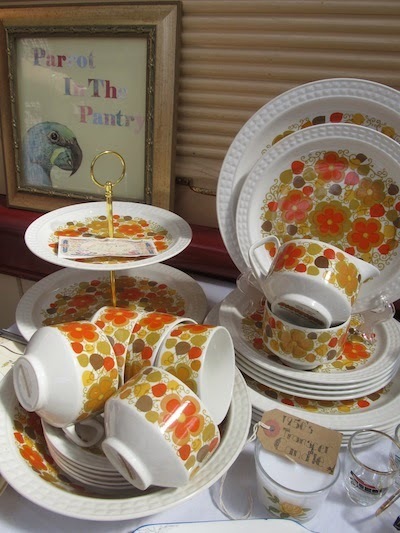 Orange and yellow just shout summer to me and the fact that this set includes a cake stand makes it ideal for a garden party. I am thinking cups of tea, finger sandwiches, french fancies and good friends. 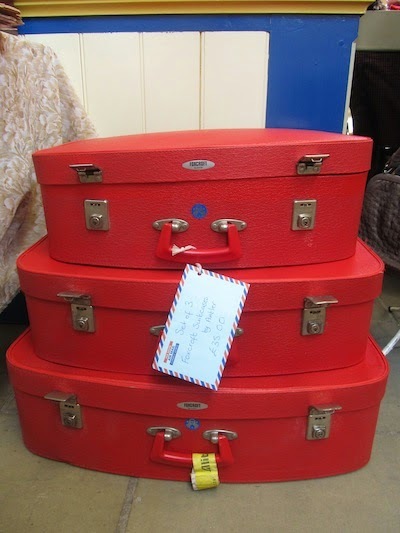 If this set is at next months Vintage Village then it could well come home with me. I reckon that I will still have plenty of summer afternoon opportunities for tea drinking with pals. Anyone that knows me will know that I am a tiny bit obsessed with vintage dolls and toys. I just never really grew out of it and am not ashamed to admit that I played with my Sindys right into my teenage years, only truly taking a break from them whilst I found a husband. 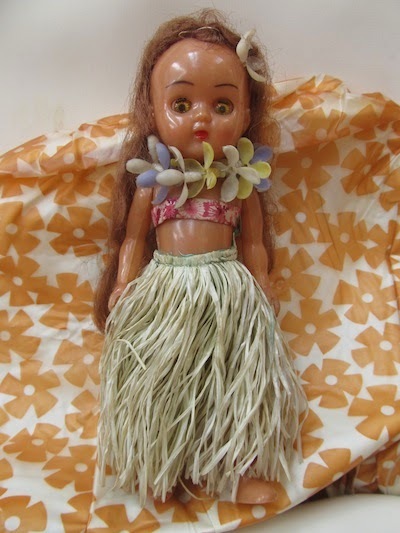 This little Hula girl is so sweet, I love her grass skirt and looking at her now I am regretting leaving her 'on the shelf'.